The 2018 NDLA Conference, Digital Change: Beyond the Device, is confirmed for February 22-23, 2018 at the Hotel RL (a Red Lion property, formerly the Holiday Inn) at 3321 S 72nd Street, Omaha. 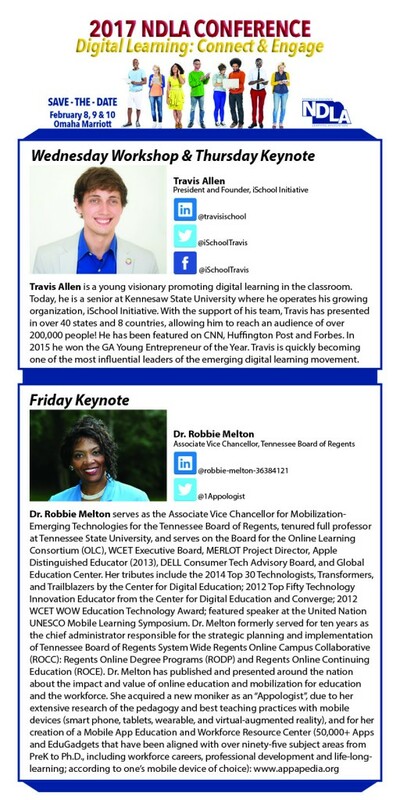 Speaker announcements and registration will be coming soon! NDLA is an affiliated chapter of the United States Distance Learning Association (USDLA). The USDLA conference, “30 Years of Driving Excellence in Distance Education,” is being held April 30th–May 3, 2017 in Indianapolis, IN, at the Hilton Indianapolis. 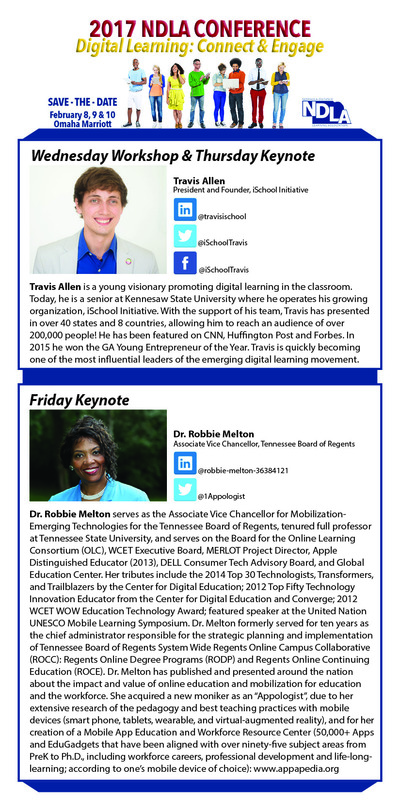 Registration is now open, and a special two-day rate is available for K–12 educators. See more information with a link to register here. Over 1500 delegates from North America, Europe, Asia, Australia, New Zealand and the Pacific Nations, Latin America, the Caribbean, Africa, and the Arab States are gathering in Toronto, Canada, October 17-19, 2017 to expand boundaries and explore new frontiers of teaching, learning and skills development. The World Conference on Online Learning: Teaching in The Digital Age – Re-Thinking Teaching & Learning, the 27th edition of the International Council for Open and Distance Education (ICDE) World Conference, is your opportunity to connect, engage, and exchange with international colleagues. See more information here. See the NDLA Conference Schedule—now available! View or download the conference schedule here! NDLA Conference Registration is Open! Happy Holidays! Our gift to you is early-bird registration! 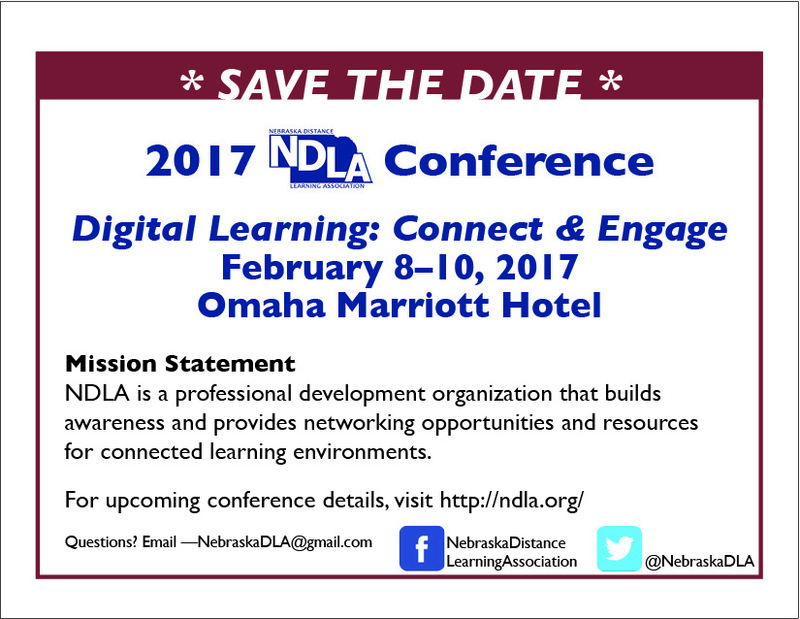 Save $15 on the 2017 NDLA Conference (#NDLA17)—Digital Learning: Connect & Engage if you register by January 27. The event will be held at the Omaha Marriot on February 9-10, 2017, with a pre-conference workshop on February 8. NDLA 2017 features two keynote speakers, breakout sessions, roundtable discussions, sponsor booths, and a pre-conference workshop (limited seating available). See the NDLA Conference page for details, or click here for registration. January 13, 2017—Wayne Fisher Award Nominations Due. This is a benefit of NDLA full membership. Contact board member Linda Dickeson (ldickes@lps.org) with your questions. January 18, 2017—Last Day for Lodging Reservations. Click here for hotel information. Take advantage of this significant discount. On October 5 Governor Ricketts proclaimed the week of November 7-11 as Nebraska Distance Learning Week. NDLA is excited to promote the following activities and events as part of #NebDLW! From Italy to the Alamo, travel to a different destination each day. Click here for the schedule and to sign up. NASA offers 30 minute programs featuring the STEM aspects of a solar eclipse. Their broadcasts start here. From Higher Ed to K-12 focus, these webinars focus on education leadership, teacher creativity, and open badges. Click here for the schedule and to register. 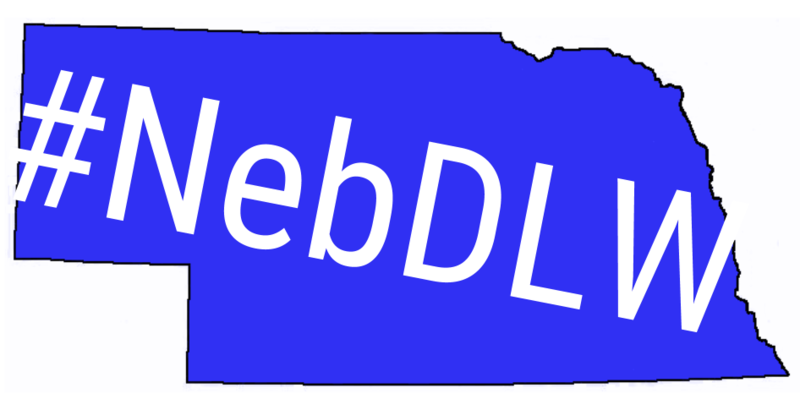 Geared for content providers, NDLA is working with NE Educational Service Unit DL Coordinators to present this workshop at two connected sites. More info here. Are you interested in going on a virtual field trip to learn in The Durham’s historic schoolroom and about pioneer and Native American life? The Museum invites you to follow along with third graders from David City. Contact NDLA for connection details. The request for proposals will be posted soon, so stay tuned! In the mean time, you can check out the speakers and sessions from past years under the Archives menu. The final program for the NDLA Conference, “Blended Pathways for Learning,” February 24-26 in Omaha, is now available for view or download here! Online registration ends Friday, February 19 so register now! New this year is a pre-conference workshop, “7 C’s of Blended Learning.” You need not be registered for the conference in order to participate in the Wednesday afternoon workshop. Use the menu above to see more information about the conference. Please join us! NDLA 2016 Registration Now Live! Our New Year’s gift to you is early-bird registration! Registration is now open for the NDLA Conference, Blended Pathways for Learning, on February 25–26 (with a pre-conference workshop on the 24th). Save $15 on the 2016 NDLA Conference (#NDLA16) if you register by February 12, 2016. This year in addition to two keynote speakers, breakout sessions, roundtable discussions, and sponsor booths, we are offering a blended learning pre-conference workshop (limited seating available). See the NDLA Conference menu links at the navigation bar above for additional details. New this year! Pre-conference workshop! Marcia Kish will present the 7C’s of Blended Learning as a pre-conference workshop Wednesday afternoon from 1:00-5:00 PM. See details here! This workshop is an additional fee, and participants need not be registered for the conference, although we hope everyone will stay for the conference on Thursday and Friday! Traveling to Omaha? We encourage you to make your hotel arrangements soon as reservations must be received by February 3, 2016. Click here for additional details. The NDLA Conference 2019 Schedule is now LIVE! Nominations open for the annual Wayne Fisher award! NDLA 2019 Attendee Registration—Now Open! Request for NDLA 2019 Presentation Proposals is now open!